Successfully Added OmniCam - Mini Camcorder DVR Kit (Sony CCD) to your Shopping Cart. , surveillance, or sports action - whatever your purpose, The OmniCam mini video camera DVR kit is your best bet for best video capture results everytime! The OmniCam mini camcorder DVR kit is actually two units in one. First, it's a top of the line extendible 1/3 inch Sony CCD lens attachment. Second, it's a first class digital video recorder (DVR) + multimedia player. Plug the lens attachment into the DVR body and the world is yours! / Surveillance Camera: With the DVR body in your pocket and the wired lens threaded down your shirt sleeve, The OmniCam let's you covertly and easily video capture live music concert footage, live sports events, and collect evidence like a private investigator. Or set the unit to motion record or even timer record, leave the camera in a good location and...hidden camera videos anyone? Multipurpose Camcorder: A fraction the weight and size of other camcorders, The OmniCam is a pleasure to use for endurance video filming events like weddings and birthdays parties. More importantly, The OmniCam records in high definition 30 frames per second AVI file format, so it will treasure your memories as much as you do! Design Excellence: It's hard to see in pictures how well built The OmniCam is, but the fact is - The OmniCam is one of the most well-constructed, well-designed mini camcorders on the market today. It has an exceptionally user-friendly menu system: just rotate the knob on top of the unit to conveniently cycle through camcorder mode, MP4 player mode, and others! What should I do next? Well, if you're shopping for an outstanding all-purpose action sports camera then you'll be really happy if you click "Add to Cart" right away and in a few days you'll be the very satisfied owner this amazing mini camcorder DVR kit. I noticed that this camcorder has motion detection. If something passes by the lens, will it keep recording forever? If you're doing surveillance work it wouldn't do to have a motion recorder that records when there is no activity so The OmniCam was designed to be intelligent and practical. When it detects motion it will begin recording. When there is no motion for 5 seconds, it will stop. You can connect the video camera system to a TV or alternative display to view high definition video footage. 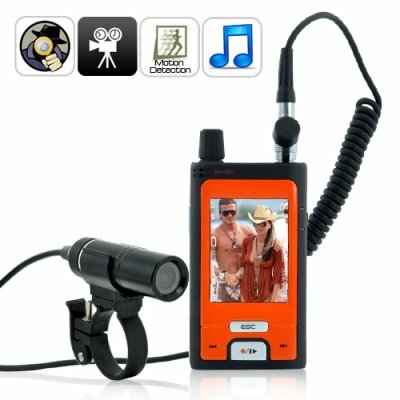 What kind of fun can I have with this all-purpose sports action camcorder? Attach both the DVR and camera lens on the front of your mountain bike and go for a nice long ride. The included mounts allow you to secure both units firmly in place so you'll be able to make some great action videos. What makes this unit better than other wired lens DVR camcorders? The OmniCam brings more to the table in terms of quality and features like a bigger screen size and support for high capacity TF microSD cards up to 16 GB. received it as shown, faster than many orders I've made from the US (to Canada), this compact unit works great and I like the motion-sensor feature. Had to download some free codecs from the apple website to use the video, but no problems finding it, so no complaints there. If only it came in a full 1080P version it would be perfect. Maybe add an optical-image-stabilization feature to help smooth out those really bouncy POV shots for a high-action version, but I like the compact one for surveillance work. Can't wait to put it to use in my work with total immersive training scenarios as a beta-test, pretty sure I'll be looking for more really soon.